Our Classes are Provided for the Courthouses listed below. 801 Richard Arrington, Jr. Blvd. N.
716 Richard Arrington, Jr. Blvd. N.
We are currently in our 12th year with now over 7,200 clients who have successfully completed and satisfied their court orders through our program. Although our classes are done on-line we are not categorized as an on-line program. We are an "At-Home" Court Programs Provider and guarantee court acceptance or your money back. CourtOrderedClasses.com has been designed for individuals who need to take court ordered courses for court ordered requirements, at the request of their employer, or for personal reasons. Court Ordered Classes is a nationally recognized program that provides court domestic violence, anger management, deferred entry of judgment, batterers intervention, drug and alcohol awareness, criminal behavior modification, divorce, high-conflict divorce, parenting co-parenting, high-conflict parenting,family violence, shoplifting theft prevention and juvenile betterment programs along with drug / alcohol assessments, anger management assessments and DV/BIP assessments, all from the comfort of home with dozens of live, "in-person" group sessions. * See if your Domestic Violence Program or Batterers' Intervention Program requires your judges consent under special circumstances. Court Ordered Classes is a member of California Partnership To End Domestic Violence. Court Ordered Classes is a member of The Center for Parenting Education. Court Ordered Classes is a member of International Criminal Court (ICC). Court Ordered Classes is a member of Theft Prevention Professionals. Court Ordered Classes, member of (IACFP) International Association for Correctional Forensic Psychology. 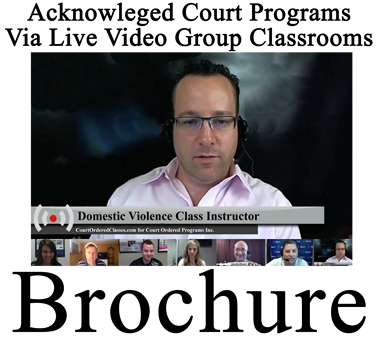 Court Ordered Classes is a top contributor of Speakers Against Domestic Violence. This Domestic Violence Treatment Program is in a "IN-PERSON group setting class" and follows the approved Duluth Method standards to insure quality treatment leading to the elimination of domestic violence and abuse. Probation Approved. We also provide Domestic Violence Assessments. CourtOrderedClasses.com is the first and only nationally recognized, completely online, self paced professional program available. Live Online Group Video Classes with 21st century tools and techniques. Satisfy your court order or employer request for anger management. Anger Management Assessments also offered. These classes are for drug/alcohol diversion court orders. When the defendant successfully completes his/her classes and stays out of trouble, the original charge is dismissed. The benefit our client is a clean record and the freedom to get on with their life. Satisfy your Batterers Intervention Program court order using our highly advanced, most up to date, self paced professional program. Our classroom style, live, group sessions will save you time and money along with our available flexible scheduling. These classes are for court ordered drug awareness, alcohol awareness, or both. When the defendant successfully completes his/her classes and stays out of trouble, the original charge is dismissed. The benefit our client is a clean record and the freedom to get on with their life. Drug and Alcohol Assessments are also available. Satisfy your County required Divorce or Separation class. Our program has proved to be the best nationwide at making you partners in raising and parenting your children for the rest of your lives. High-Conflict Divorce program also provided. Court Ordered Classes offers Parenting, High-Conflict Parenting and Co-Parenting Classes. Our highly respected "Proof of Completion" satisfies the court order with the judge, and all family professionals. Shoplifting, anti-theft, and theft awareness court orders can all be satisfied with these Theft Prevention Courses. All online, self paced professional program. CourtOrderedClasses.com is the first and only nationally provided, completely online, self paced professional program available. Satisfy your court order for Criminal Behavior Modification Classes. Working with Juvenile Courts across the nation, these classes allow children between the ages of 13-18 to learn tools to better themselves. Classes are a blend of domestic awareness, anger, drug/alcohol and criminal behavior. Often teens find it difficult to attend any court ordered class due to travel distances, parent schedules, and most other life commitments. These courses are ideal for court requirements but lots of parents or guardians have their child or children take this program for educational purposes as well. Court Ordered Classes a Parole and Probation Department Approved Provider. Court Ordered Classes a National Anger Management Association Approved Provider. Court Ordered Classes and CourtOrderedClasses.com are a Copyright © 2007-2019 All rights reserved by Court Ordered Programs, Inc.